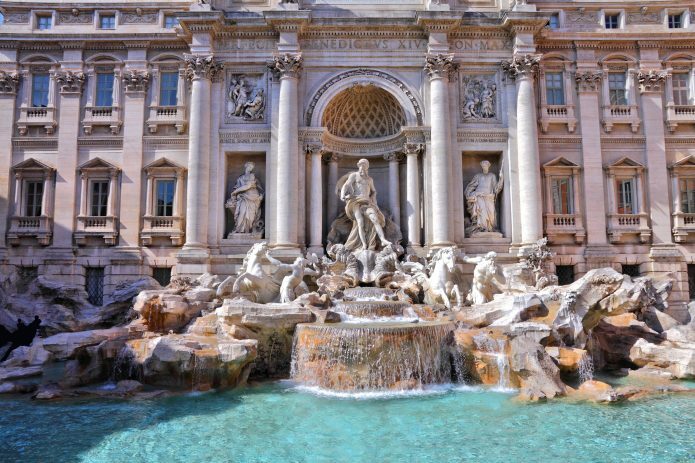 Immortalized by Marcello Mastroianni and Anita Ekberg in the film by Fellini “La dolce vita”, the Trevi Fountain is one of the main attractions of Rome and should be an essential stop on your itinerary in the capital. If you want to visit Rome in 3 days or if you only have one weekend, you can not leave without having seen it and thrown your coin into the water to be able to come back! The Trevi Fountain is a very large sculptural complex, so much so that it occupies almost the entire square. It was created by Nicola Salvi in 1732 and completed in 1762 by Giuseppe Pannini. Made with travertine, marble, plaster, stucco and metals, it represents Ocean on a cart pulled by two horses (a wild one and another docile, that represent the different moods of the sea), which in turn are guided by tritons. The fountain, today as when it was built, is fed by one of the oldest aqueducts in Rome, the aqueduct of Acqua Virgo (Acqua Vergine), built between 19 and 22 a.C. from Agrippa. The name Trevi derives from the fact that at this point three ways converged. On the eastern side of the Trevi Fountain there is a large vase in stone called “ace of cups” because it recalls the playing card. It is said that during the construction works, a barber, who owned his shop on the square, continued to criticize the Salvi’s project. Salvi then added the vase so as to prevent the barber from seeing the work and continuing to make his annoying criticism. Since the aqueduct was completed on this site there has always been a fountain. In 1453 Pope Nicholas V commissioned Leon Battista Alberti to restore the water way. In 1629, Urban VIII commissioned Bernini to design a new fountain, but it was never built. In 1730 Pope Clement XII announced a competition to choose the best architectural projects. The Salvi’s project won the competition and two years later the works began. The last restoration of the Trevi Fountain dates back to 2015. The cost of 2.2 million euros were financed by the Fendi fashion house and the work brought the fountain back to its former glory. The most famous tradition is the tossing of a coin into the fountain: by doing this with closed eyes and turning on the opposite side of Palazzo Poli, one would favor a future return to the city. The origins of this tradition are not well known. Perhaps it could derive from the ancient custom of throwing into the sacred sources obols or small gifts to propitiate the local divinity, as it happens for the wells of desires. There is no tourist who does not know this tradition and who does not perform this ritual. The Municipality of Rome established in 2006 that all the reclaimed coins (a sum equal to about three thousand euros per day) should be destined for Caritas in Rome. In fact, around 3,000 euros are drawn every day from the fountain. All those who take the money for themselves are prosecuted criminally. According to another tradition, when people still drank water from the fountain (and the water of Trevi, which today is used only for irrigation and to feed the fountains, was considered among the best in Rome, because it is not calcareous) girls asked their boyfriend who was leaving to drink it in a glass, that was later shattered in sign and wish of fidelity.